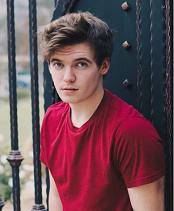 Grayson Goss has made a name for himself as a Disney voice actor, YouTube vlogger and digital influencer. After finishing high school, Grayson moved to Los Angeles to help launch his career in entertainment. Since then, Grayson has starred in shows like Disney Jr’s Sofia the First (voice actor for Hugo) and S.H.R.I.E.K. (Dylan); made onscreen appearances in The Mick, Raising Hope, Conan, Game Shakers; and featured in national commercials for Chevrolet, Hasbro, Play Station, and Acuvue. He’s also known for his strong social media presence on Instagram, Twitter and YouTube, which has allowed him to partner and create content for growing brands. At nineteen, Grayson has already found success on multiple media platforms. He has an impressive list of credits and skills, and continues to try his talents in other fields, like music, modeling and improv comedy.